The ARC Dollhouse is fun for all ages no matter if you're a kid who loves to pretend or an adult who collects beautiful and unique dollhouses. 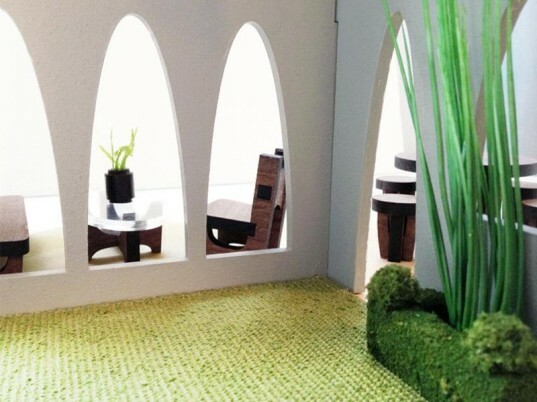 Inspired by Oscar Niemeyer, Brasilia and the Palácio do Planalto, this amazing dollhouse was designed and made by 3 Star Studio. 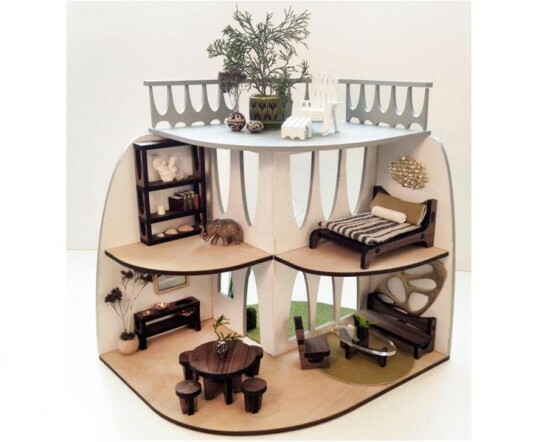 Keep reading to learn more about this lovely modern dollhouse. 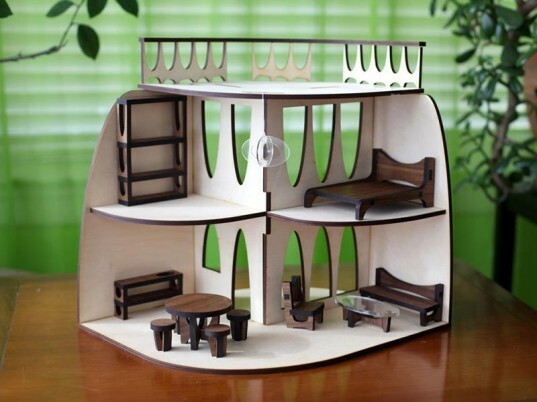 This dollhouse is 3/4 or 1:16 (1″ dollhouse = 16″ full sized house) and designed so that it looks great from every angle. The house has one large living area on the bottom floor that can be split into multiple rooms, plus two individual rooms on the second story. There’s also an awesome third floor deck (perfect for a roof garden) and a super spacious outdoor patio on the first floor. Ample windows allow for plenty of light throughout. 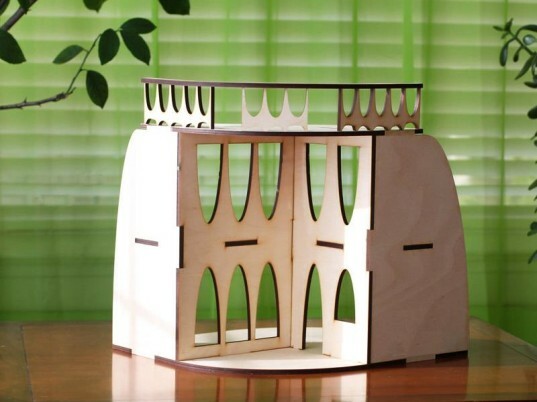 The ARC dollhouse is laser cut from sustainable Baltic birch plywood, grown in Wisconsin. The entire home is designed and produced in the USA. This dollhouse arrives to you flat packed and ready for assembly. You’ll just have to provide your own wood glue and a bit of time. The ARC is made with simple notches that allow for easy assembly and long-lasting strength. 3 Star Studio has also designed two sets of furniture specifically for the ARC. The furniture sets are available in either solid walnut with clear acrylic details (shown above) or birch plywood (shown in next slide). 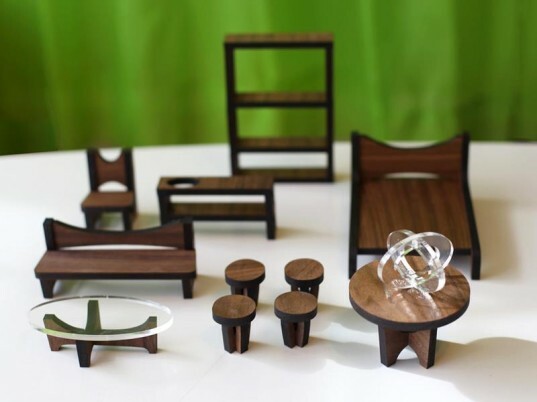 Each set comes with 12 full pieces of modern dollhouse furniture – enough to outfit most of your dollhouse space. This dollhouse is carefully made but does contain small parts, so little ones should be supervised while playing. Overall, the dollhouse is recommended for children ages two years and older. This dollhouse is very affordable at just $85.00 plus an inexpensive $25.00 – $50.00 per furniture set. You can order directly on the 3 Star Studio website. Note that they will ship internationally, but have no set price because of the weight of the dollhouse. If you’re international (out of the USA) write the company before ordering to discuss shipping costs. 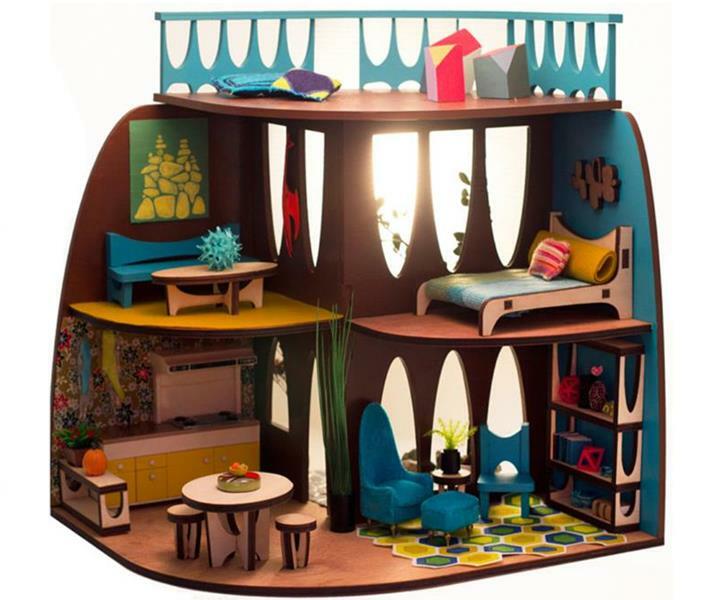 This dollhouse is 3/4 or 1:16 (1" dollhouse = 16" full sized house) and designed so that it looks great from every angle. The house has one large living area on the bottom floor that can be split into multiple rooms, plus two individual rooms on the second story. There's also an awesome third floor deck (perfect for a roof garden) and a super spacious outdoor patio on the first floor. Ample windows allow for plenty of light throughout. This dollhouse arrives to you flat packed and ready for assembly. You'll just have to provide your own wood glue and a bit of time. The ARC is made with simple notches that allow for easy assembly and long-lasting strength. 3 Star Studio has also designed two sets of furniture specifically for the ARC. The furniture sets are available in either solid walnut with clear acrylic details (shown above) or birch plywood (shown in next slide). 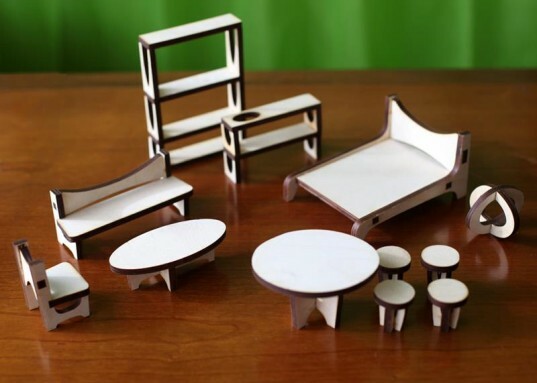 Each set comes with 12 full pieces of modern dollhouse furniture - enough to outfit most of your dollhouse space. This dollhouse is very affordable at just $85.00 plus an inexpensive $25.00 - $50.00 per furniture set. You can order directly on the 3 Star Studio website. Note that they will ship internationally, but have no set price because of the weight of the dollhouse. If you're international (out of the USA) write the company before ordering to discuss shipping costs.